LIVINGROOM, 4 BEDROOMS, 2 BATHROOMS, KITCHEN, TERRACES, AND NICE PRIVATE POOL. 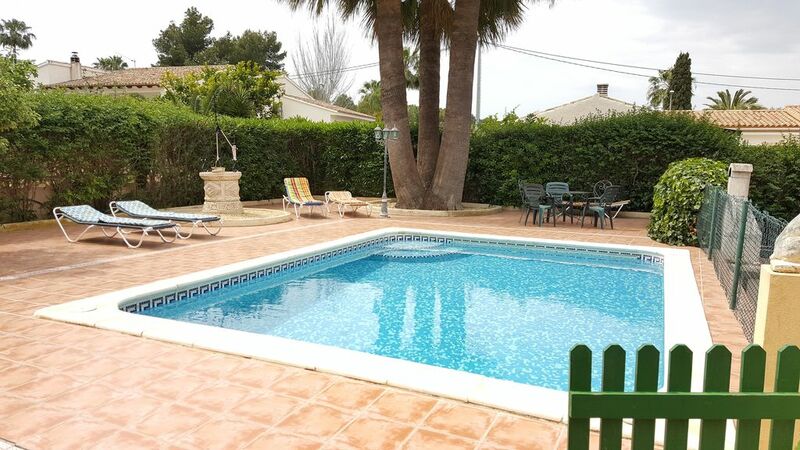 Lovely spacious private villa, 5 minute walk from the centre of Albir. Highly recommended to anyone looking for a great villa with huge garden area, car parking available, great pool, and sun all day round.. we really enjoyed our stay..
what can i say this was my fifth time staying here & we are already booked for another 2 trips. we love it, easy access to all amenities & a good price too. Pleasant transaction and would recommend to a family/ 2 families or several couples. Had a brilliant holiday at this villa.Very clean and spacious.villa in great location car not needed.Pool area great and plenty of sun loungers to relax in the sun.Great bbq if u fancy night in.Lovely restaurant at the bottom called Classica Gourmet lovely food.Ingeborg who owns villa lovely and very helpful.Going back May cant wait for another lovely stay. Nous avons passé un très bon séjour dans cette jolie maison avec tout le confort. La propriétaire est très accueillante et très gentille. Take the motorway, from Alicante to Benidorm. Go off, at the Benidorm/Callosa sign. Once you have paid the ticket, take the second to the right 'Alfaz del Pi', then drive until you are at the crossing of the Mac Donalds (about 3 km.). There go into Albir, to the right. At the Lidl-roundabout, go straight/95 degrees, over the 'Avda. del Albir' direction to the beach. After passing the 'Consum-supermarket' on the right, you take the first to the right (up), then you drive and at the first split up, you take to the right (Camí de la Cantera). Then it is the 4th street on the right. Carrer Tauro. Go straight about 100 m, the house is on the left. In the area you really can do all kind of activities. In Benidorm, you find all the attractions, and a lot of people. Of course the beach is one of the attractions. If you have children ideal, if you like the night, also. If you like quiet and 'romantic' places, you will like Altea, with its own Port, and very nice restaurants.